The Democrats are still painfully working on the health-insurance bill. The problem is that there are many factions within the Democratic Party that have different concerns and each one is trying the squeeze all the others to get its way on its pet issue. For example, Rep. Bart Stupak (D-MI) and about a dozen supporters want very strong language to ban abortion and are fighting tooth and nail to get it. The Blue Dogs are worried about budget deficits for years to come. Without a substantial number of votes from these groups, Speaker Nancy Pelosi can't get the 216 votes she needs to pass the Senate bill, which would be followed by a sidecar bill to make small changes to the Senate bill. 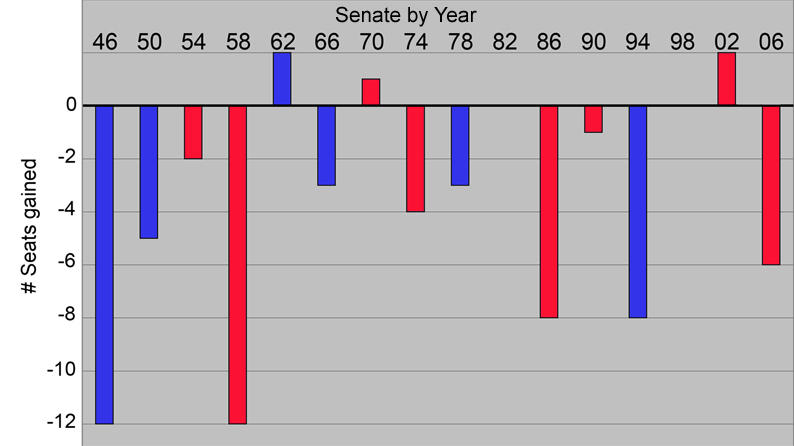 Oddly enough, all of last year the Senate was the bottleneck. Now that there are more than 51 senators willing to use the budget reconciliation process to get the sidecar bill through the Senate, the House is the problem. This situation is not unusual however. On any contentious bill where every vote counts, every senator and every representative has an effective veto over the bill and many of them use their leverage to push their pet ideas. The Democrats are trying furiously to get the bill passed before the Easter recess, lest there be a repetition of last August, with noisy tea partiers capturing the news again. Everyone understands this, but about 20-30 representatives seem to want to play "chicken" and use this knowledge to force the leadership to give them what they want. In theory, the Blue Dogs could be placated by adding fixes to reduce the subsidies for poor people, thus reducing the projected federal debt. Changes like that are clearly allowed in the reconciliation process. Stupak's demands are impossible to meet because items in a reconciliiation bill are only allowed if they have a substantial impact on the budget. Changing the rules about abortions is simply not allowed, so Pelosi is trying desperately to find some other way to satisfy Stupak, such as a subsequent bill tightening the rules on abortions. But Stupak knows such a bill would fail in both chambers of Congress and Obama would veto it if it somehow passed, so he isn't buying. Dealing with the Blue Dogs is easier since what they want are parameters tweaked, for example, at what income level does someone qualify for Medicaid. Lowering this by a few thousand dollars will get a few Blue Dog votes. Abortion does not lend itself to this kind of tweaking. In the midterm elections, the party occupying the White House nearly always loses a substantial number of seats in both the House and the Senate. Current polling indicates that this year does not appear to be an exception. 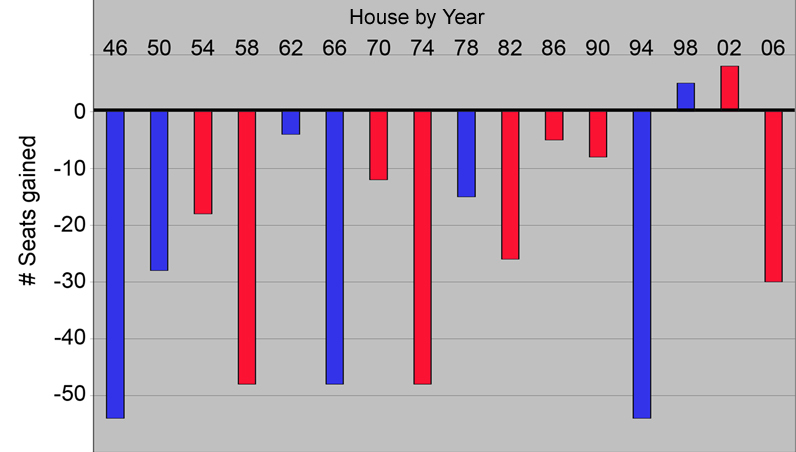 The chart below shows the House "gains" from 1946 to 2006 for all the midterm elections, where positive means that the party in the White House gained seats and negative means they lost seats. The color is that of the President's party. As can be seen, Bill Clinton avoided losing seats in the House in 1998, largely because people were angry with the Republicans for impeaching him and in 2002, in the aftermath of the Sept. 11 attacks, George Bush avoided a loss. In all other years, the party in the White House was hit hard. The Senate picture is roughly the same, as can be seen here. A correlation between the House and Senate results exists, but it is weak since Senate races often turn on the (oversized) personalities of the Senate candidates whereas House races tend to be more generic. Does this mean the Democrats' goose is cooked? Not entirely, but the signs are not good for them. In particular, the health-insurance bill is likely to dominate in 2010. If the Democrats fail to pass a bill, they will have shown themselves incapable of governing even with huge majorities in the House and Senate and the voters will surely give the others guys another try. If they do pass a bill and manage to effectively sell it, they might be able to limit losses. One of the ways they could sell it is to emphasize the early deliverables, such as sick children having a legal right to health insurance from day 1. Photo ops with President Obama appearing with children who have cancer and can now get a life-saving operation would help the Democrats, but probably nothing can turn the tide and stem Democratic losses in 2010. Political scientist Alan Abramowitz has written an interesting piece on demography and politics. Briefly summarized, usually the Republicans win among white voters, although the margin varies from year to year, but Democrats always win the nonwhite vote in a landslide. For example, in 2008, Obama lost the white vote by 11 million votes by won the nonwhite vote by 21 million votes, which resulted in a net huge victory. 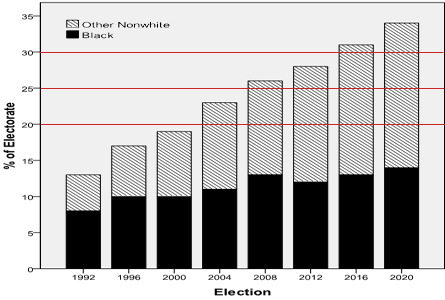 Abramowitz made a chart, reproduced below, showing the growth of the nonwhite vote over time. In this chart, Abramowitz counts Latinos are nonwhites since their voting behavior much more closely parallels that of blacks than of whites and they tend to have the same policy concerns as black voters. Projections out to 2020 are fairly accurate because anyone who will be of voting age in 2020 was born in 2002 or later and those data are known. In addition, if immigration continues unabated, the percentage of nonwhites is only likely to increase because many of the immigrants are legal and nonwhite and they tend to become citizens 5-10 years after arrival. What the chart shows is that the percentage of nonwhites is likely to grow from the 27% it was in 2008 to almost 34% in 2020. If the Democrats get 2/3 of that vote, which history suggests they will, that could add something like 3-5% to the Democrats' totals in a national election. In a close election, that could be decisive. In a table, Abramowitz shows that among the 65+ set, 81% are white whereas among 5-17 year olds (as of July 2007), only 59% are white. In short, the Republicans' base of (older) white voters is shrinking and the Democrats base of (younger) nonwhite voters is growing. This means that unless the Republicans can figure out how to capture a larger piece of the nonwhite vote, they have a big problem coming up. And poll after poll has shown that the Republicans main policy positions--lower taxes and smaller government--are extremely unpopular with nonwhite voters, who want a larger, more activist government. If the Republicans don't change their policies, they are unlikely to pickup many new voters in the nonwhite demographic, but if they do change their policies, they may alienate their base. If they win big in 2010, as seems likely now, they may fall into a trap of thinking they are doing the right thing and just continue doing it, when the real reason for a possible big win in 2010 is the historical near-certainty of the voters being disappointed with the newly elected President. Yesterday, President Obama had a meeting with Sen. Chuck Schumer (D-NY) and Sen. Lindsey Graham (R-SC) about immigration reform. Obama surely understands the consequences of the above item well and may try to exploit it to the Democrats' advantage after the health-insurance bill passes or fails. In short, Latino voters want a new law that allows the 12 million illegal aliens in the country to have a path to citizenship since many of these illegals are their relatives and friends. By passing such a law, Obama would win the loyalty of Latino voters for a generation (not to mention how the illegals themselves might vote when they became citizens). And for Obama, immigration reform is a twofer because the issue very badly splits the Republicans. The Tancredo wing of the Republican party (and to a large extent, the tea partiers) are violently against rewarding the illegals by letting them become citizens, no matter how convoluted the path. Their view is simple: they broke the law and should be deported. On the other hand, the big-business wing of the Republican Party (think: Walmart) loves the idea of a large underclass of people who are afraid to go to the police to report abuses by their employers. If Obama were to push immigration reform as the next big issue, the mere sight of many Republicans foaming at the mouth against any bill that allows illegal aliens to become citizens is going to energize Latinos and get them to vote in much larger numbers in November than they otherwise would. From Obama's point of view, the best possible outcome might actually be a successful Republican filibuster killing the bill, thus hugely angering the Latino community. Anger is always a big driver in midterm elections, which is why the out party does well in them.